Dundee becomes the UK’s first UNESCO City of Design. It gives me great pleasure to be here to extend my warm congratulations to everyone who has played a part in bringing this prestigious UNESCO City of Design accolade to Dundee, and indeed Scotland. A magnificent achievement. It is fitting that we are here in this wonderful new Discovery Centre. Life Sciences research in Dundee has an international reputation and this new centre (opened October 2014) provides exciting new opportunities breaking down barriers between scientific disciplines by bringing them together. I’m delighted too that it includes a substantial art gallery, curated by Duncan of Jordanstone College of Art and Design, to promote arts and science collaboration and host international exhibitions and work by local artists. 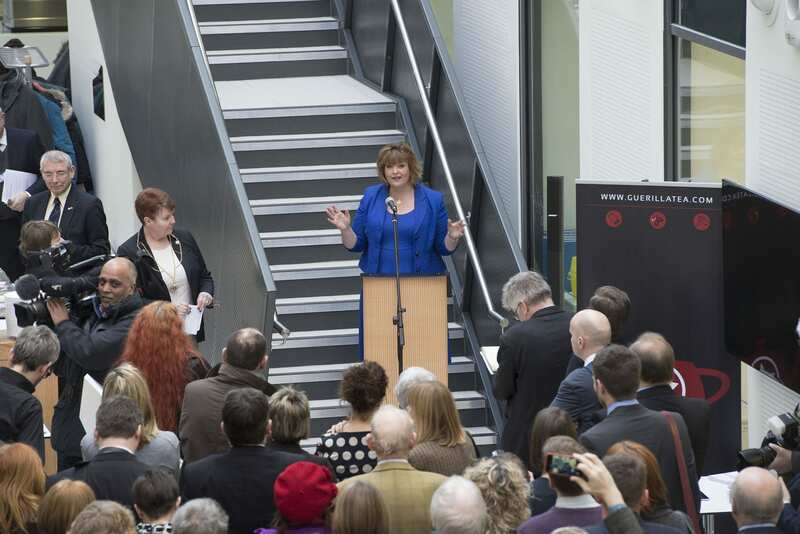 This is a richly deserved accolade and further strengthens Dundee’s growing reputation as a hub of cultural and creative excellence and an international centre for the creative industries. It is entirely fitting that Dundee is the first city in the United Kingdom to be recognised as a UNESCO City of Design. Dundee is an international success story continuing to use culture and creativity as a catalyst to promote regeneration and design, areas the city have been pioneers in. Dundee has strong foundations. Through its two leading universities, the University of Dundee and Abertay University, design is a prominent area of teaching and research. Dundee’s new title recognises the design innovations that it has contributed to the world, including aspirin, biomedical research that has led to hundreds of new cancer drugs, cartoon illustrations, Oor Willie and Desperate Dan, computer gaming to the Internationally renowned Dundee Rep. Dundee has variety. Just last weekend (23-25 January) Abertay University hosted Global Game Jam – a 48 hour international event including around 150 students, lecturers and professionals collaborating to design brand new games. Bringing people with different creative skills together to build something new and exciting. The Scottish Government places great importance on Culture, design and Heritage because it can make an invaluable contribution to our quality of life and wellbeing, bringing real social and economic benefits to people and communities. No-where is this more clearly articulated than here in Dundee. UNESCO have recognised too that the city of discovery is on a pioneering journey. Dundee now join an illustrious network of cities as a City of Design, Buenos Aires, Berlin, Montreal, Nagoya, Kobe, Shenzhen, Shanghai, Seoul, Saint-Étienne, Graz, Beijing, Bilbao, Curitiba, Helsinki and Turin. All identified for their outstanding contribution to areas of creativity and design. I am delighted that Laura Aalto from Helsinki UNESCO City of Design joins us here today. I visited Helsinki last March to build upon the strong links between Scotland and Finland. We both have much to gain from working together with a common goal of using innovation, expertise and international co-operation to promote sustainable economic growth and we both can learn from each other further in areas including architecture, innovation and culture. So this is a very exciting opportunity for Dundee and for Scotland to promote our cultural and creative talent and showcase our inspiring building design and places to the world. The aspirations of Dundee chime with my vision for a Scotland which promotes Scotland’s talent – both at home and to the world. In late 2013 I visited the Hannah Maclure Gallery which exhibits the work of artists and designers working with digital media to celebrate and showcase Dundee’s exciting work to a local and international audience. The curator of the gallery is also the curator for the Neon Festival, Scotland’s only Digital Arts Festival. For me it perfectly encapsulates the real connections and flourishing partnerships that are the very essence of Dundee. Over the last 20 years, it is difficult to think of many other single buildings that have made such a difference to their communities than Dundee Contemporary Arts (DCA). When it was completed, just before the turn of the century, the DCA demonstrated the way in which a single, well-designed cultural building could forefront the drive to regenerate a whole city. Its uplifting design and popular appeal immediately enticed visitors from near and far and helped to put Dundee onto the international stage in the visual arts. A key principle demonstrated by the DCA was the importance of investing in quality in our cultural facilities and in our built environment more generally. Since that time, Dundee has moved from strength to strength and has shown itself to be a place of outstanding vision and ambition with regard to new development and regeneration. The city is undergoing transformational change, led by over £1 billion of investment in the regeneration of its waterfront. Mike Galloway, Dundee’s Director of City Development, as I’m sure many here will be aware, is the lead officer for the Waterfront Project. He is known for his belief that we should ‘always strive for quality over quantity’. Dundee is doing that in grand style. The development shows great insight with regard to the links between the quality of the built environment, culture, tourism, business and employment to reinforce and enhance the distinctive identity of Dundee. In recent times, the city has become home to some very high quality architecture. Nicoll Russell Studio’s design for The Space and Page\Park’s refurbishment of the McManus Galleries are just two examples of work by Scottish firms here which can sit proudly beside that of the famous international architects in Dundee – the Maggie’s Centre by Frank Gehry and the V+A by Kengo Kuma. Quality is a trait Dundee is not short of. Today, numerous design initiatives are led by Dundee organisations, aimed at creating the next generation of designers across all disciplines, keeping highly talented graduates here in Dundee, creating new ideas and new companies. Design in Action, Scotland’s national Knowledge Exchange Hub for the Creative Industries is led by Duncan of Jordanstone College of Art & Design and helps companies across Scotland innovate through the strategic application of design. 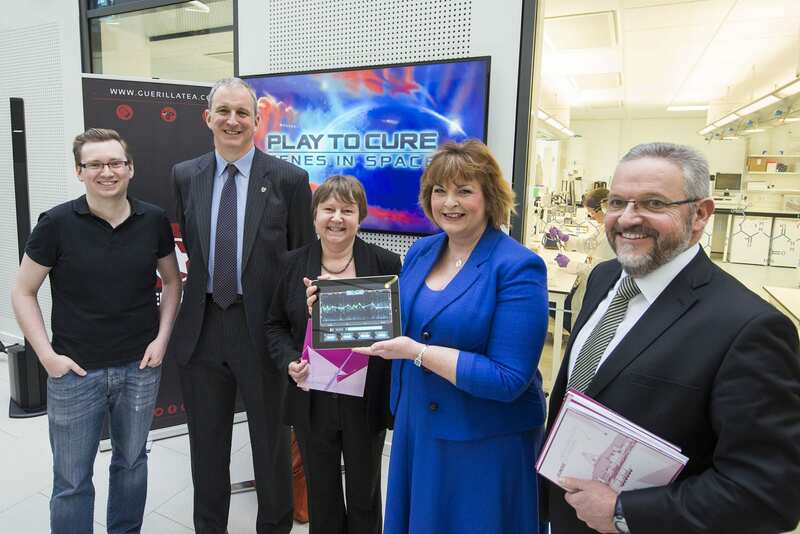 Abertay University trains game designers and developers, and is at the heart of the city’s thriving game development cluster. Inspiring designers based in Dundee include all those here today including jewellery designer Jane Gowans; architect Kirsty Maguire; fashion designer Hayley Scanlan and game designers Guerilla Tea; and there are many others including Sophia George, the V&A’s first ever Game Designer in Residence; graphic designer and Fleet Collective co-founder Lyall Bruce. The list keeps getting longer and longer and longer! The programme of focus years in Scotland include in 2016, the Year of Innovation, Architecture and Design and 2017 the Year of History, Heritage and Archaeology. 2016 has been designated as a year in which Scotland’s achievements in innovation, architecture and design will be showcased and celebrated with a programme of activity aimed at supporting and driving the nation’s tourism and events sector. An ideal fit then with Dundee’s new role as a UNESCO designated City of Design. These years will both bring opportunities for communities, visitors and businesses in the city to join the celebrations of each of the themed years. They will help to align and boost activity to focus on visitors across the globe who are keen to learn more about Dundee and this country’s rich history, architecture, design, heritage and culture. I believe that there are opportunities to find new ways of working by creating new cultural partnerships and ventures, exploring new ways to reach out and inspire new audiences at home and around the world. Fitting then that this new accolade for Dundee will provide opportunities to establish new partnerships and share learning with other creative cities such as Helsinki, Shanghai and Turin. Our new First Minister has set out her ‘One Scotland’ Programme for Government. This underlined the Government’s intentions about how we create a wealthier and more equal society. Tackling social justice and reducing inequalities in Scotland is one of the most important priorities of this Government. I am well aware of the continuing needs for capital investment and funding particularly when a commitment has been given to ensure the development and delivery of key capital projects. And speaking of capital projects…. The cornerstone of the ambitious Dundee Waterfront development, V&A Dundee is expected to generate more than 270,000 visitor engagements per year and contribute an additional £11.6 million per year to the local and national economy. The £25 million capital funding we have allocated to this iconic project underlines the Scottish Government’s firm commitment to working with the project board to ensure its delivery, success and long-term sustainability. V&A Dundee will be an incredibly important asset to the city and to Scotland as a whole in both cultural and economic terms. The project has already played a major role in the recent award of Unesco City of Design status for Dundee. It will highlight Scotland’s exceptional design talent and illustrious design heritage, stimulate design innovation and attract hundreds of thousands of visitors from far and wide to its world-class exhibitions. The Scottish Government’s strong support for V&A Dundee builds on our extensive programme of investment in cultural infrastructure in recent years. I am pleased that Dundee recognises the value of working collaboratively with other institutions both at home and abroad. International engagement makes a crucial contribution to sustainable economic growth and increases Scotland’s international reputation. Culture, innovation, research and design can transform lives and facilitate international dialogue and must be at the forefront of our continued development, a driving force in our engagement with the world. An international perspective should be placed at the heart of our priorities – it is about connecting us to the world, enhancing our reputation abroad, bringing new perspectives, fresh ideas and also international research initiatives. But we must focus our efforts at home too. Dundee is a city which is proud and confident, rooted in culture and heritage; a city which not only cherishes its diverse heritage and traditions, but also continually seeks to create further opportunities to share and to celebrate. Today is the opening line of a new chapter in Dundee’s story. This award is down to the people of Dundee who have embraced the city’s design led vision to change their communities, change their lives and regenerate the city. Thank you all for your commitment in enhancing the rich cultural heritage and vibrant reputation of Dundee and our truly unique country.